“And here’s the shocker: I will kill you. I will really kill you. And that’s why the rapporteur of the UN is here, investigating extrajudicial killing,” Duterte said, referring to drug dealers as he was addressing an orthopedic conference in Davao City, as cited by The Philippine Star. Those words cannot come from a stable mind. Unpresidential gutter language. PDu30 is scared of the UN HR body. If there is nothing to fear, just invite them to come with zero conditionalities, nothing. Having conditionalities means there are fears, there are things to hide. Many sectors also bring up the LP/yellow/dilawan in the visit by Ms. Callamard. Why divert the issue? PDu30 and his many agencies can quickly organize a forum with that lady anywhere, anytime, challenge her to a public debate because she opted to come here, pulverize her arguments if they can, they did not do it. Reposting some comments from my friend Bernard Ong, posted in his fb wall May 5 and 6, 2017. Malacanang objected to the 'unannounced' visit of UN Special Rapporteur for Extrajudicial, Summary or Arbitrary Executions Agnes Callamard. "We are aware that Dr. Callamard is currently in the Philippines and we are disappointed that, in not contacting our government in advance of this visit, she has sent a clear signal that she is not interested in getting an objective perspective on the issues that are the focus of her responsibility" - Spokesman Ernesto Abella. Hold your carabao, Ernie. She is not here for you. No need to announce her visit dahil wala kayo sa agenda niya. Your are being paranoid. Which part of "extrajudicial, summary or arbitrary executions" triggered your praning reaction. Fentanyl muna to ease your worries. Turns out Dr Callamard is here to attend & address a drug policy forum sponsored by CHR & Free Legal Assistance Group at UP Diliman. Government is actually represented in the forum by its lead drug agency - Dangerous Drugs Board. Sayang. 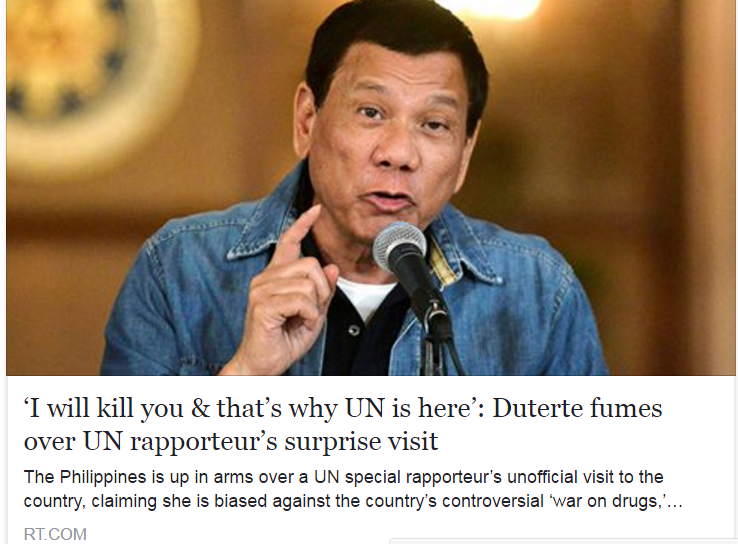 Kung hindi lang sana takot si Duterte sa UP Diliman, he could have gone there to share his "Kill. Kill. Kill" approach. So there. Dr Callamard is not here for you. Wait lang muna, your turn will come. You can relax. She is also braver than you. Unlike you, she is not afraid of going to UP Diliman. 1. Takot na takot, at galit na galit, sa isang UN Human Rights official na inimbitang magsalita sa UP. 2. Nagsisilbing bugaw ng China - #1 supplier ng shabu, at nangaagaw ng lupa at dagat ng Pilipinas - para sumuko na lang ang Pilipino. Kayo na lang. Susundin ko ang mga halimbawa nila Lapu-Lapu, Bonifacio at Gregorio Del Pilar. Ayaw ko sumama sa mga duwag at traydor. Warning: long post. UN Special Rapporteur on Extrajudicial, Summary or Abitrary Executions Agnes Callamard gave the opening speech at the drug policy forum at UP Diliman. Link to full transcript in Comments section. Presidential counsel Salvador Panelo used her speech as basis to claim that she is incompetent to probe killings in War on Drugs in the Philippines – that Callamard already made conclusions based on news reports, some videos, opinions of critics, and hearsay. 1. There’s a document called ‘Our Joint Commitment to Effectively Addressing and Countering the World Drug Problem’ drafted by heads of states assembled at UN General Assembly. 2. Joint Commitment calls for more comprehensive approach that considers diverse factors behind drug problem – including social development, public health, justice & human rights. It calls for more effective approaches than punishment model some governments have adopted. 3. Joint Commitment urges governments to respect human rights, protect freedoms, uphold rule of law in their drug policies. 4. Joint Commitment recognizes dependence is a health disorder, whose social causes & consequences can be prevented & treated thru scientific evidence-based treatment, care & rehab. The governments affirmed the importance of data, scientific research, sharing of information including best practices on drug prevention & control. 5. Governments did not commit to War-on-Drugs approach. Instead they called for balanced approach including health, rights & justice. 6. They did not suggest death penalty as an appropriate or effective response to drug trafficking or use. Instead they spoke about proportionate sentencing & alternative punishments. 7. In April 2016, the UN General Assembly recognized that ‘War on Drugs’ does not work. It is well documented around the world that bad drug policies fail to address drug dependency, drug criminality & drug trade. 8. Further, War on Drugs only makes things worst. They add problems such as extrajudicial killings, breakdown of law, vigilante crimes, torture, disproportionate sentences for drug possession, etc. It can foster a regime of impunity promoting rule of violence, eroding public trust in institutions, breeding fear. 9. In all research undertaken around the world, none of the countries that adopted War on Drugs made the drug problem disappear. In fact, the opposite happened.